Bodhisena, a monk from Madurai is the oldest documented Indian resident in Japan whose impact on Japanese culture perseveres even 1,300 years after he first docked in Japan. Bodhisena, or Bodaisenna as pronounced in Japanese, was an Indian scholar and monk who was born around 704 AD. The multi-directional flows of Buddhist influence is illustrated through his life and journeys which tied swaddles of Asia into a civilisational embrace. Bodhisena came to believe that Manjushri (the bodhisattva of wisdom) lived on the Chinese mountain of Wutai, hence he travelled there to pay veneration. He met the Japanese ambassador to the Tang court while he was in China, who induced him to go to Japan on the invitation of the then Emperor, Shomu, a devout Buddhist. 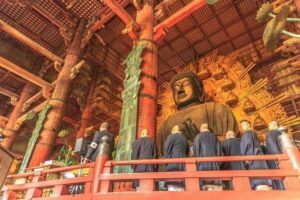 When he came to Japan, he had a gaggle of theological glitterati who contributed in shaping the highlights of Japanese Buddhism and courtly culture. One of them was Genbo, a bureaucrat of Emperor Shomu’s court at Nara, who spent 17 years collecting over 5,000 Buddhist texts in China. Another one was Kibi no Makibi, who contributed in the development of the Japanese syllabary and script of katakana (Japanese syllable) which is still in use. The time Makibi spent on travelling and learning with Bodhisena is sometimes accredited for the influence of Sanskrit on katakana. Bodhisena’s disciple from Champa, Buttetsu was one of the last among monastic travellers. He went on to teach a dance style that featured themes taken from Indian mythology, set to a musical rhythm that is common in South Asia but unknown at that time in Japan. These dances came to be known as rinyugaku and were absorbed into the local artistic magnum opus. Until Bodhisena’s arrival, Japan’s source of knowledge of Buddhism was entirely through Korea or Japan. As an Indian, he was highly acclaimed and housed at Daian-Ji temple, the pre-eminent education and research institute for Buddhism at the time. The Indian monk taught Sanskrit and helped establish the Kegon school of Buddhism. Unlike a few historical Buddhist sects, the Kegon continues to proliferate till date. 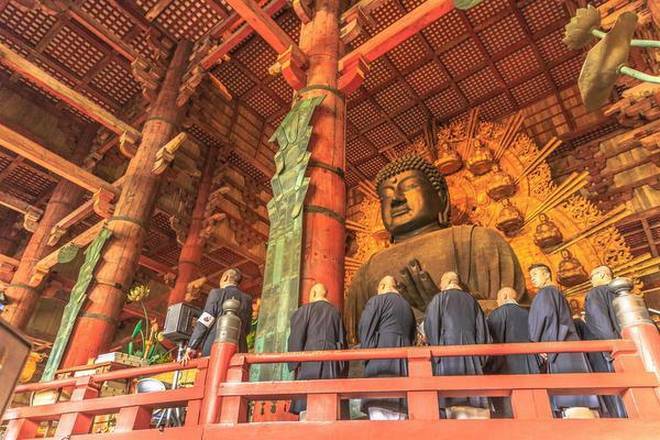 Its headquarter is at Nara’s Tōdai-Ji temple, a UNESCO World Heritage site, that was founded in 738 AD and officially opened in 752 AD, best known for its 500-tonne, 15-metre-high Buddha-the largest bronze statue in the world. Bodhisena died in 760 AD and was buried in Ryusenji temple, located on the slopes of Mt. Omine. Though, Indian diaspora in Japan is not major but has successfully embraced a colourful cast, from revolutionaries to textile traders. But Bodhisena has largely influenced the culture of Japan, and that itself is a major remark of the India-Japan relation.